A recently retired client had one item on his wish list for his new build home project, a media room. The room would accommodate his recently purchased 4K TV, his Naim hi-fi system and his Quad speakers. At first fix cabling stage we installed high quality speaker cabling, high speed 4K HDMI cables, Cat6 for connections to a HDAnywhere Modular whole house video switching system and SmartTV services. 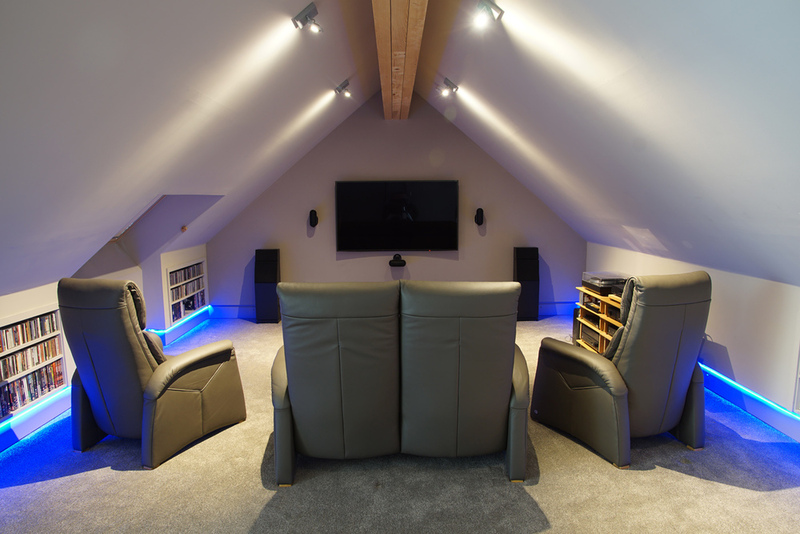 Once the plastering and decorating was completed we meticulously connected up the existing hi-fi equipment, blended it with the new 4K ready Yamaha AV receiver, Q Acoustics Q7000 surround sound speakers, Panasonic blu-ray player and provided an all-in-one learning remote control for ease of use. This installation was completed on budget and was ready for the client from their first day of moving in. Colour changing LED strip lighting adds that extra layer of WOW!